Monopartite, circular, ssDNA genome (+) genome of about 2.6-2.8 kb. 3' terminus has no poly(A) tract. There are coding regions in both the virion (positive) and complementary (negative) sense strands. The genome is replicated through double-stranded intermediates. The replication (Rep) protein initiates and terminates rolling circle replication, the host DNA polymerase being used for DNA replication itself. There is a potential stem-loop structure in the long intergenic region (LIR) that includes a conserved nona-nucleotide sequence (TAATATTAC) where ssDNA synthesis is initiated. The short intergenic region (SIR) contains bidirectional polyadenylation signals. Transcription is bidirectional from the long intergenic region (LIR) which contains two divergent promoters: a V-(virion) and a C-(complementary) sense. The resulting C- and V-transcripts encode four proteins. On the V-sense: the movement and CP. On the C-sense: RepA and Rep (which is expressed as a splice product of RepA and RepB ORFs). NATURAL HOSTS Mostly monocotyledonous plants (except for tobacco yellow dwarf virus and bean yellow dwarf virus which infect dicots). 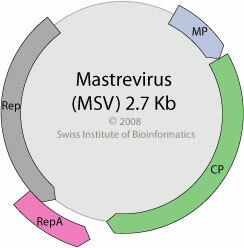 Mastrevirus protein RepA is responsible for inhibiting host retinoblastoma protein and inducing transition from the G1 to S phase in preparation for virus replication since the virus targets differentiated non-dividing cells. .